The 1st half of the season is in the books now, with the All-Star Game behind us now and it's time to come up with a mid-season report card for our Sox. The Good: Brock Holt. He came up and has been on a tear for most of the season out of the lead-off spot. He's hit .327 with 3 home runs and 21 RBI's hitting out of the lead-off spot. He also had a 5-hit game against Houston on Sunday, the first of his young career. Also, Christian Vasquez has been a revelation offensively since coming up. Granted, it's a small sample size, but he's hit .455 and 5 RBI's at big league level since replacing A.J. Pierzynski on the roster. He's only had 11 at bat's but he's shown some promise with the big league Sox. 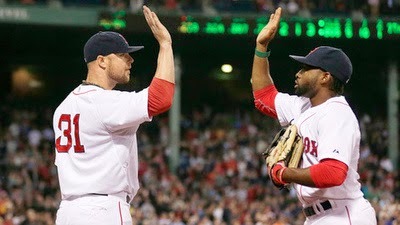 The Bad and the Ugly: The rest of the Red Sox offense. Let's see here: 25th in runs scored, 22nd in batting average, 27th in slugging. .242 win men in scoring position. Yikes. Not pretty. And one of the guys that supposed to be a key for us offensively, Xander Bogaerts has been struggling mightily of late, hitting .132 in July. It's been tough to watch because I want to believe in the kid, but it's been tough of late because of how poorly he's been in the last month or so. The Good: The top of the rotation has been good all year, with Jon Lester leading the team in ERA with a 2.65 mark and strikeouts with 134, meriting an All-Star selection in the process. John Lackey has been leading the team in with, posting 10 so far this year. The bullpen has been decent this year, with Burke Badenhop, Junichi Tazawa, Andrew Miller, and Koji Uehara all posting ERA's under 3. Rubby de la Rosa has also shown some promise in his time up, with a 2.89 ERA in 6 starts. The Bad: Where to start with the bad? While the Sox staff is far from the worst in the league, there has been plenty to improve on. Felix Doubront hasn't been pitching well at all when he's been on the hill, with a 2-4 record and a 5.17 ERA in 13 games (10 starts). Jake Peavy has also had his struggles in the 1st half, managing only 1 win (1-8 record) in 19 starts and 4.59 ERA. There are plenty of others who are struggling, i.e. Edward Mujica, but there's still a lot to get to. As a staff, they have a 3.83 ERA, which is a little on the high side for me, and is good for 14th in the league. The Sox are also 22nd in the league in batting average against (.258), so while there have been bright spots (8th in quality starts), there's still plenty to improve upon from a pitching stand point. The Red Sox have plenty to improve on in the 2nd half, whether it be via trade or in house, if they want to get back into playoff contention. That's no easy task, and they'll probably have to make a few moves at the deadline if they want to get back into October baseball, but they ended the 1st half on a 4-1 tear, so they'll look to continue that into the 2nd half.